Bali offered me many new experiences, such as introducing me to three different master teachers or gurus. One guru is a massage therapist and healer, another is a teacher, and the third a philosopher teacher by the name of Cok Rai. 76 years of wisdom and a love for life abound in this man, and he graciously shared a few insights with my group in a five hour conversational session. I must first explain some of the protocol when visiting such a teacher. Most guru teachers are very understanding of westerners who may not know all the protocol that one should use when visiting them and their ashrams. However, by making an attempt at honoring their ways, one will get high marks and stronger attention from those you visit. One of my guides, a native Balinese named Agus – was noticeable upset when we didn’t have the proper flower offering, including a small money donation for our visit. So off we went to an offering market to purchase hand made offerings to which we added our monetary donation for our meeting with Cok Rai. Agus was the gatekeeper for my group. He made certain we didn’t do anything improper or embarrass ourselves (or probably him too!) Like a mother hen, before he let us go through the compound doors of Cok Rai, he inspected me thoroughly to ensure that my sarong was properly fit, that my white T shirt was clean and that I had a sash on. Once I passed inspection, Agus seemed relieved and he allowed us to go to the teacher. Curiously, Agus stayed behind and waited patiently for us elsewhere in the compound during our visit. Balinese live in compounds, with living areas for extended family in various buildings, usually several open air pavilion areas, gardens and buildings for various aspects of work all within the compound. We were led to a small pavilion where an old man was sitting on a raised platform, and were invited to sit on the lower platform with a group of three other students. We totaled six with the teacher. I must comment on this sitting on hard floors, preferably concrete with straw mats that the Balinese insist on. Where ever one goes, the custom is to sit on the floor in this manner, or to sit on top of one’s sandals (or flip flops) for hours. I was told that this is supposed to assist one’s spiritual development, patience and detachment. I guess I have a long way to go if this is the case! After brief introductions and a generous offering of ginger tea and fried bananas, Cok Rai asked, mostly through an interpreter, if we had any special questions for him. Most teachers start the serious discussion in this way. When we began, it seemed to me like an advanced metaphysical philosophy class, although the universal truths and questions we discussed were in fact very simple. We questioned away. First he read our energies, then he consulted ancient wooden boards of wood with writing on them, and finally he commented and told us stories relating to our question. With a good deal of humor throughout, the conversation warmed up and he then began asking us questions. He spoke of how the organs hold our emotions, so it is important to bring energy to them, to circulate it and release it. He downplayed the heart, and he said too much emphasis is placed on the heart chakra without taking care of the rest of our organs energetically. 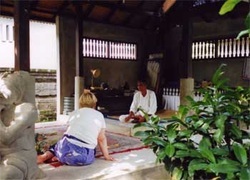 Of course when you meet with a teacher and talk, you all converse in a group setting, (and around the steps of the platform where you all sit, you will notice a second tier of people who have magically gathered sitting lower than you and the teacher, who are listening in on the teachings.) So, anything personal you ask about or any healing that is delivered no matter how private is done and answered in the public forum. To this end I was privileged to be the only person asked that afternoon if I wanted an attunement by Cok Rai. Of course I said yes, and was led to lie down on a straw mat (on the concrete floor) with my head on a straw “pillow”. Before Cok Rai really even began, he grabbed my left big toe and said that I bruise very easily (which is true). He then took first a small stick, then a stone and proceeded to press each implement very strongly on my toes and between my toes. I’m certain he was activating pressure points with some form of reflexology. He told me many things about myself and gave me advice – then proceeded to proclaim me quite healthy overall and said that I am a very strong person emotionally (which is also true.) Somehow he knew I was from New York (I was born there –but when introduced I only told him I was from the US). Cok Rai spoke how joyous he was to be working with Lightworkers from across the planet. He assured us we have a very real and important job of bringing Light into this planet, and holding the love energy that others are not yet able to. He plainly suggested that the next 19 years were going to be difficult energy and planetary wise, but that there would also be wondrous events for us all during these coming years. By the end of our time together, an interesting thing happened. For the last hour Cok Rai came down from his platform and sat in a circle of love and companionship with us. Our friendship, respect and love for one another was profound. The differences in our language, cultures and customs were meaningless. Our group, including Cok Rai felt blessed and when “class” was dismissed we all went forth with new understanding, light and encouragement.